718.83(other derangement of joint, not elsewhere classified, forearm. Ulnolunate abutment is between the ulnar articular seat and the lunte. Ulnotriquetral abutment is between the ulnar styloid and the triquetrum. Ulnar variance: determined on neutral rotation P/A view. Measured by drawing a transverse line at the level of the lunate fossa and a second transverse line at the level of the ulnar head, and determining the distance between the two lines. Positive ulnar variance increases with power grip and pronation. Consider pronated grip view. (Tomaino MM, J Hand Surg 2000;25Am:352). Normal = neutral (articular surface of distal ulna and radius equal). Postive (ulna longer) associated with ulnocarpal impaction, lunotriquetral ligament injurie and TFCC tears. 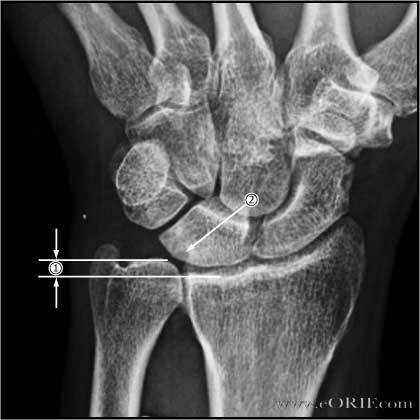 Negative (ulna shorter) associated with carpal instability, Keinbock's disease. Ulnocarpal impaction is indicated by cystic / sclerotic lesions in the lunate and proximal medial ulna best seen on the P/A view. Dorsal sensory branch of ulnar nerve injury. 7-10 Days: dressing changed, removable volar splint placed. Start OT for ROM. 6 Weeks: check xrays. Advance therapy. Discontinue removable splint and advance to strengthening once bony union is evident. 3 Months: Advance strengthening, work on any ROM deficits. Consider bone stimulatorif union is not evident. 6 Months: follow-up xrays. Return to unrestricted activity.